The ER or 'Emergency Room' nurse is a person who is great at quick thinking, decision-making, and multitasking. He or she has the training, aptitude and willingness to adapt to whatever the day happens to bring, as every day is different in the emergency room. Best suited to this role are nurses who appreciate the fast-pace and challenge of not knowing exactly who is coming through the door and what may be wrong with them. The ER nurse enjoys helping patients, and doesn't allow the emotions of patients in trauma to affect their mindset. The emergency room nurse is responsible for accurately assessing then triaging patients in a thorough yet efficient manner. Many hospitals will hire nurses to the Emergency Room directly after graduation and licensure. The hospital assumes a role in providing both didactic training and an experienced preceptor to help transition and mentor the new graduate until they successfully complete the intake process. For nurses with experience in a different specialty, the transition into the ER will be hospital-specific, and is generally much shorter. Often nurses from other departments can apply for a posted internal position to change departments. Like other nursing positions, Emergency Room nurses require successful completion of a college or university degree that culminates in either an ADN or BSN. Nurses with these qualifications are then able to take their state's NCLEX-RN examination. With licensure out of the way, nurses can use the title 'Registered Nurse' or RN and can apply to jobs as such. These requirements are the basic requirements for the ER nursing role. While most hospitals will gladly hire nurses who have achieved an Associate's Degree in Nursing (ADN), many are shifting to Bachelors of Science in Nursing (BSN) as the competitive qualification. Some teaching hospitals have raised the standard and exclusively hire BSN educated nurses. Other hospitals require the ADN nurse to complete their BSN degree within a few years of employment. See our list of emergency nurse practitioner programs. In addition to licensure, the Certified Emergency Nurse (CEN) credential is a nationally accepted certification for ER nurses. Developed by the Emergency Nurses Association, certified nurses are considered to have attained a level of expertise on the standards and practices of emergency patient care. RNs that have CEN certification have undergone rigorous training to hone their practical and theoretical skill, to say nothing of the ethics of triaging a stream of patients in the most appropriate, ethical and effective manner. To take the CEN exam, an ER nurse must have two years of emergency experience as an RN. See our list of post master's emergency nurse practitioner graduate certificates. Virtually every hospital has an emergency admitting and triage area where injured or ailing patients can enter and be assessed for medical treatment and stabilized, as the situation requires. Each triage area has to be staffed with appropriately training nursing specialists for maximum safety and efficiency. 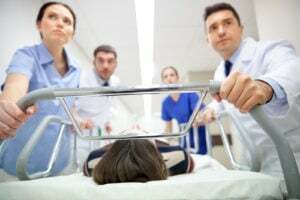 While transfers of complicated cases or extensive patient trauma to larger and more elaborate hospitals often occur, very few facilities aren't equipped to receive and admit patients on an emergency basis. Alongside the interdisciplinary team, the ER nurse performs all types of tasks - from icing a swollen ankle to performing CPR and treating victims of major trauma. The theme among these tasks is a through and insightful evaluation to determine the extent of injuries, and the development of an appropriate course of action to achieve stabilization, and balancing other patients' needs. Common tasks include administering medication, fluid resuscitation, blood transfusions, wound care, device placement, and much more. What Are the Roles & Duties of an Emergency Room Nurse? Record care plan that encompasses patient education component. Mentor and engage with clinical and support staff to advance the education, communication and leadership of the department as individuals and as a whole. With increased health of the general population, there are some segments of nursing care that are remaining stable, however, because accidents do happen at home, on the work site, and incidentally throughout our world, there will always be a need for highly trained emergency room nurses to assess, triage, and stabilize accident victims. Salary for an Emergency Room nurse is about $62,010 and ranges from $46,710 - $92,815. Like other aspects of the nursing profession, where you choose to live sometimes has an affect on salary.